In the years between Mrs Kumaratunga’s elevation to the Presidency and his death, the Liberal Party office in Castle Lane was a second home to many Tamil parliamentarians, and his assistance in promoting the proposals that were being formulated was sought by some presidential confidantes. Chanaka faithfully obliged, but his heart was not in it. Initially he had borne the Asitha/Ashraff/Chandrika betrayal with equanimity because in any case he had much more faith in Gamini Dissanayake, and Gamini Dissanayake had turned to him to draft the manifesto on which he was to stand in the Presidential election. He made it clear to Chanaka that he wanted him in a leading advisory role in Parliament, but he was killed before the election. Though the manifesto they had agreed on appeared as his widow Srima’s manifesto when she was selected as the replacement UNP candidate, the new leader of the Party repudiated it when he took over. Now everyone recognizes what a wonderful manifesto it was, just as people have also realized that the manifesto Chanaka drafted, together with others such as Kumar Ponnambalam, for Mrs Bandaranaike for the 1988 presidential election was also one of the most enlightened of our political statements, in many respects, but in particular with regard to the ethnic question. Unfortunately that manifesto too was jettisoned, when the wing represented by Anura Bandaranaike was superseded by his sister’s allies after Mrs Bandaranaike lost the election. Despite her own enduring pluralistic credentials, Mrs Kumaratunga’s allies at the time were more chauvinistic, and they reverted to a reactionary position for the 1989 election, the statist centralism that she also seems sadly to have hankered after despite her pluralism – which is why perhaps she did not bother, having characterized herself as merely a peon when she was Chief Minister of the Western Province, to make the adjustments that would have allowed greater power to the Provinces on the basis of the 13th Amendment. Ironically, it is under President Mahinda Rajapaksa that now, finally, the government is taking steps to ensure that the spirit of the 13th Amendment can flourish, with the simple changes in enabling legislation that should have been introduced twenty years ago. Chanaka’s view of the 13th Amendment way back in 1987 was not, it would seem, particularly different from President Rajapaksa’s now. 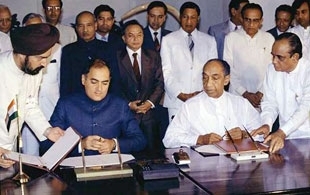 In fact the statement the Liberal Party issued at the time of the Indo-Lankan Accord was remarkably in accord with the stance of the Sri Lanka Freedom Party at the time, except with regard to its outstanding initial assertion, an assertion that the SLFP at the time seemed to repudiate, though it may have struck a chord with the rural peasantry that had long been its backbone, and which President Rajapaksa himself represented. The fact is, Chanaka believed passionately in devolution as a political principle, not as a principle of ethnic empowerment. His political philosophy was based on individuals, and it had no place for communitarian selectivity, of the sort now advanced by less traditional liberal philosophers. But as an adherent of individual freedom, and therefore the empowerment of individuals to develop their full potential, he believed in subsidiarity, and the right of small entities to exercise powers in their own interests. He knew that a highly centralized government could have no idea of the needs and aspirations of regions at the periphery, and that was the basis of his fervent advocacy of devolution long before anyone else in mainstream politics. This was what made the minority parties, who had been in favour of devolution for other reasons, such devoted friends of his, as they expressed so eloquently at his funeral. At the same time, he understood the importance of ensuring the unity of a country which had devolved power, for his unique study of political principles and their application worldwide had helped him to understand the dangers of fissiparous tendencies. So he had no qualms about expressing the need for strong institutions at the Centre, which would exercise certain powers at the periphery. But an integral part of this was his insistence that the periphery too should exercise power at the Centre, which is why, in the days when it was profoundly unfashionable and he had to stand alone in advocating it, he insisted on the importance of a Second Chamber. 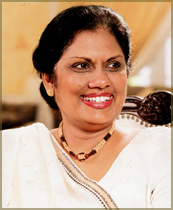 None of this was sufficiently understood or emphasized in the constitutional proposals put forward during Mrs Kumaratunga’s time in office (just as the importance of electoral reform based on clearcut principles of proportionality as well as representativeness was not understood or promoted). 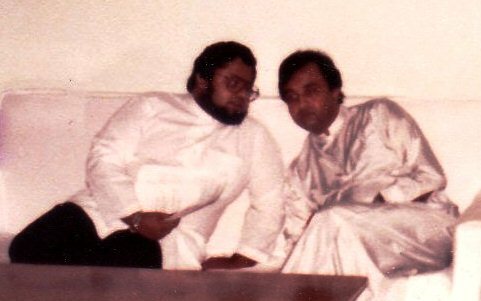 Had Chanaka been in Parliament on behalf of the Muslim Congress, it could have played a crucial part in promoting Tamil aspirations whilst assuaging Sinhala fears, but by leaving him out Mr Ashraff ensured that the Muslim Congress remained emphatically Muslim. That may have been what several of his supporters wanted, but it was not Mr Ashraff’s original vision, and it is what made it much easier for others to entice its leadership away after Mr Ashraff’s death with parochial incentives that Mr Ashraff himself would have scorned. That Chanaka could have brought people around to his point of view may seem an optimistic assertion, but the fact is, he did this on several occasions when no one else would have succeeded. The most significant of these achievements, in the present context, is the manner in which he persuaded Mrs Bandaranaike to agree to contest Provincial Council elections 1988. Sadly, his contact with the party developed too late for this achievement to bear fruit, for it happened only after nominations for four provinces had closed. The proposal was met with enthusiasm by politicians in the three provinces for which nominations had been called subsequently. I do not know whether Mr Rajapakse was amongst them, but I have no doubt that he would have taken full advantage of the decision had it been carried out, and become Chief Minister of the South in 1988 and begun the process of rural development that sadly had to await President Premadasa’s very different centralized approach, in which the South was just one amongst several areas which required his attention. Typically for the excessively egalitarian SLFP of those days, when Mrs Bandaranaike announced her decision, politicians in the four provinces in which the SLFP had missed the bus complained that this would be unfair, so the Central Committee of the party reaffirmed its original stance. Mrs Bandaranaike did then allow some SLFP members to join the Liberal Party for the purpose of these elections, though we were able, having only been officially recognized (along with the Muslim Congress) earlier that year, to contest in the Western Province alone. 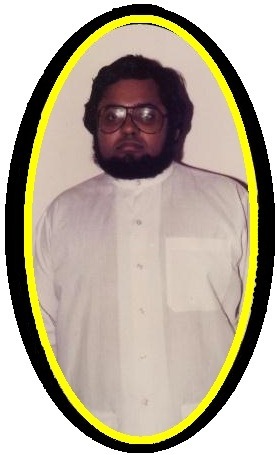 I remember we were hopeful that a then very young Jeyaraj Fernandopulle would join us, but it was only his similarly named uncle who contested the 1988 Provincial Council elections as a Liberal. Unfortunately the party did not commit resources, except in Dompe where, with Anura Bandaranaike’s fullest support to his friend Gamini Gunaratne, the Liberal Party obtained at least some representation in Provincial Councils, long before the SLFP or the JVP, which only entered the fray in subsequent elections. History is of course full of ifs, but there is no doubt that, had the SLFP contested even a few Provinces and won representation, as the United Socialist Alliance did, its candidate would have done much better at the 1988 Presidential election. It is now forgotten how ruthlessly the UNP, and also the USA, used the resources made available to Provincial Council members to promote their Presidential candidates. 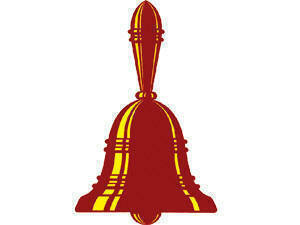 Given how narrowly Mrs Bandaranaike lost, with some sections in the South hardly voting because of the JVP initiated boycott, there is no doubt that with Mahinda Rajapakse as Chief Minister, or even Leader of the Opposition, of the Southern Province, the scare tactics in which the UNP ably abetted the JVP would not have succeeded. The other area in which ignoring Chanaka’s advice proved fatal was with regard to the Muslim Congress, which had agreed to be part of the Democratic People’s Alliance under which Mrs Bandaranaike contested the Presidential election. Mr Ashraff had asked for various concessions for the forthcoming General Election, and Mrs Bandaranaike had initially been advised by her Muslim supporters not to accede, but we engaged in concerted shuttle diplomacy in which Mr Ashraff was characteristically accommodating. What he asked for at the end was self-evidently just, and Mrs Bandaranaike agreed. But when Chanaka went next morning for the signing ceremony, it was to find that Mrs Bandaranaike had changed her mind. Anura characteristically said he could not face Mr Ashraff, and it was Chanaka who had to break the news, which understandably made Mr Ashraff furious. He promptly entered into discussions with Mr Premadasa, who granted him the very little he felt entitled to request, and he then threw the full weight of his support behind the UNP. As we had patiently explained to Mrs Bandaranaike earlier, when she told us that Mr Ashraff controlled only a proportion of the Muslim vote, even that proportion was essential for her to win. As it happened, Mr Premadasa’s plurality over all other candidates was around 20,000, his majority over Mrs Bandaranaike less than 300,000, so that if even a quarter of the Muslim vote is thought to have been influenced by Mr Ashraff, there is no doubt that Mrs Bandaranaike’s failure to stand by the agreement Chanaka had negotiated on her behalf was a disaster – for her, and for Anura Bandaranaike, because it was her defeat then that allowed the old guard in the party to argue that his sister had to be brought back to lead the party to future victory. It was doubtless Chanaka’s personal affection for and adherence to Anura in the battle between the siblings that prevented him making any running as far as Mrs Kumaratunga was concerned, after she was elected and initiated a process of constitutional reform. This may also have precluded her from making use of his abilities and understanding of constitutional questions, even though they both shared a pluralistic vision. On the other hand, as was clear from Jayampathy Wickremaratne’s comments as well as her failure to make use of Rohan Edrisinha or Paikiasothy Saravanamuttu, who had both enthusiastically contributed to her election, she was perhaps constitutionally incapable of the energy required to advance her ideals. Sadly there was a great window of opportunity, shortly before Chanaka died, when he told me that Mr Sidharthan had mentioned the possibility of an acceptable compromise whereby the North and East would be demerged in exchange for greater real powers for both. This I believe was the substance of a proposal put forward by a TULF MP, but it was not satisfactorily followed up, and with Chanaka’s death the possibility of a widely respected honest broker, at least as far as the minorities were concerned, also died. Oddly enough, that concept, which lay at the heart of the Liberal approach to devolution, was ignored for the next decade, to have resurfaced only now. That was not the only aspect with regard to which Chanaka was a visionary, a visionary whose ideas I believe the country will in time adopt, but perhaps too late for their full positive impact. I have mentioned electoral reform above, and a second chamber, both of which have been discussed in full in his seminal work ‘Ideas for Constitutional Reform’, an abbreviated second edition of which was brought out last year for the 20th anniversary of the establishment of the Liberal Party. I will therefore confine myself here to just one other element, noted in the Liberal Party statement of 1987 which referred to ‘the acceptance of Sinhala, Tamil and English as equal official languages in terms of the Indo-Sri Lankan Accord’. It has now been long forgotten that that too was a provision of the Accord, the only provision that was not implemented, due largely to the opposition of the United Socialist Alliance, of which the Kumaratungas were then leading lights. I would have thought those two would not have been opposed to that provision, but they may have still retained some of their old left inclinations, and therefore acquiesced in the LSSP/CP position that English was an imperial language. Those two parties, still fighting the old Surya Mal battles, were determined that English not be given an official position, and typically J R Jayewardene, to keep them happy, relegated English to the status of a link language, and also managed to denigrate Tamil too in the process, by making it not an official language on the same level as Sinhala, but ‘also…an official language’ while Sinhala retains the definite article. As a result, nothing much was done to enforce these provisions – again until this government took office, and under the able guidance of Mr Gunasekara a concerted effort to implement the official languages provisions of the Constitution has begun. Since the Communists, except in the sad sixties and seventies, seem to have been positive throughout about Tamil, perhaps they will be able to change things conclusively now. With regard to English however, their opposition in 1987 may well prove fatal. Very little could be done officially to improve English abilities during the following decade when it became crystal clear that it was a world language we had to institutionalize if our young people were to be empowered to take advantage of new opportunities. It took Mrs Kumaratunga six years to finally decide to reintroduce English medium education, six wasted years during which many of the reforms essential for preparing the country for the 21st century were delayed owing to limitations of vision and sheer lethargy about going beyond personal cronies for ideas and energies. We are opposed to English if it remains the property of a few, but if it is to be given to everyone, we are all in favour. That can only be done if it is an official language, and the state takes responsibility for spreading it. Interestingly, when Chanaka realized that the UNP had done away with the Official Language reform component of the Accord, he tried to introduce it into the DPA manifesto on which Mrs Bandaranaike was to contest the 1988 Presidential election. I was not present for these discussions, but he told me afterwards that, apart for from the parties representing minorities, he had received support for this proposal only from the JVP. He used to refer to them as my friends – even though I hardly attended those meetings, and had only a fleeting acquaintance with the politbureau member (I think) who attended, a young man called Dhammika who was killed in the following year – because he thought I was too sympathetic to their social concerns, but for once there was some indulgence in his sarcasm. The next time I met Dhammika – it was the last occasion – I asked him about this, and expressed some surprise, since the Inter-University Students Federation, which we thought of as a surrogate for the JVP, had been vehemently opposed to English. They do not understand, he told me in essence. We are opposed to English if it remains the property of a few, but if it is to be given to everyone, we are all in favour. That can only be done if it is an official language, and the state takes responsibility for spreading it. A few weeks later the JVP withdrew from the talks, and embarked on the process of confrontation that caused so much tragedy, to them as to the entire opposition and the country at large. Before they left, Chanaka told me, they had been forthright in telling him how much they appreciated his contribution. The JVP and the Liberals might disagree on almost everything, they had said, but at least Chanaka was serious about politics. The rest, they said, pointing to several individuals, some of whom are still in active politics, seem to understand nothing of the problems this country faces. In his own way, I think Chanaka felt flattered. Certainly that was probably his finest year, when he was just thirty, and helped to keep together for so long so many disparate parties, when he persuaded Mrs Bandaranaike to agree to restore Article 29 of the old Soulbury Constitution (only to have her repudiate this when Cyril Mathew was trotted out of retirement to attack her about this), when he flung himself into electoral politics and braved UNP thugs carrying pistols into polling booths (no one voted for us, except in Gampaha, but then hardly anyone voted, for the UNP thugs used to go into booths and fill up all the ballot papers and put them into the boxes themselves, adding a new dimension to the concept of impersonation). It was a period in which we became full members of Liberal International, only the second Asians to achieve this, in which he was invited to Sweden to help define liberalism in the modern age because the future Swedish Prime Minister thought an essay of his the best exposition of modern liberalism then available, and when he wrote, in his review of John Gray’s ‘Liberalism’, a description of his great hero John Stuart Mill that to my mind fits him too, in its account of ‘the incomparable Liberal thinker….. (who) set out the distinction between individual liberty and democracy, the tyranny of the majority, the case for proportional representation, the dangers of excessive state power, the case for equality for women, the dangers of social conformism, and the evils of racism’. Chanaka wrote then that ‘John Stuart Mill never fails the modern Liberal’. 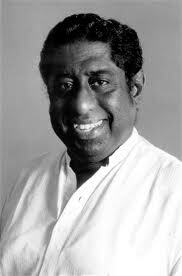 So, too, in reading what he wrote so many years ago, in studying his initial responses to the Sri Lankan crisis, responses that never wavered in their exposition of pluralism along with democracy, we realize that Chanaka Amaratunga never fails the modern Sri Lankan in his analysis of where we should be going. The current determination of the government to fully implement the 13th Amendment, without its obnoxious enforced merger, is a sign that at last perhaps the visionary will be vindicated, in this respect – which may lead to greater concern with other ideas he put forward, that will also serve to take this country forward.